At PAX West 2016, Razer held a keynote to announce upgrades to their existing products as well as new products. Upgrades for the internals of the Razer Blade and Razer Blade Stealth were announced, keeping each laptop up to par with today’s laptop processing demands. New in their extensive gaming keyboard selection is the Razer Ornata and Razer Ornata Chroma. Also new is the product of their latest partnership with MAINGEAR in the form of the MAINGEAR R1 | RAZER Edition PC gaming tower. The Razer Blade and Razer Blade Stealth laptops are both well-established in the gaming laptop front. At the Pax West Razer keynote, Razer announced upgrades and updates to these products, keeping both up to par with today’s standards. The new Razer Blade now hosts a next-generation NVIDIA® GeForce® GTX 1060 graphics card and is optimized for VR performance. The Razer Blade Stealth now takes a step up with the latest 7th Generation Intel® Core™ i7 processor. The laptop’s ceiling goes up even higher with up to 1 TB of PCIe solid-state storage and up to 16 GB dual-channel memory. In the saturated market of gaming keyboards, gaming companies are constantly endeavoring to make keyboards that are unique from the rest in some way. Enter the Razer Ornata, Razer’s new gaming keyboard featuring keys of a brand new hybrid of membrane and mechanical switch components. The Razer Ornata aims to give users the soft “squish” found in membrane (chiclet) keys while still achieving the crisp “clicky-ness” of mechanical keys. The goal is a key-pressing experience that’s both comfortable and responsive. The Razer Ornata houses all of the proper trimmings of the gaming keyboard of today. Individually backlit keys complete with various lighting features are present and are controlled via Razer’s standard customization engine, Razer Synapse. Each keyboard sports mid-height keycaps, programmable keys, and 10-key roll over. The Razer Ornata Chroma allows for 16.8 million color choices for its keys while the Razer Ornata illuminates only in the “Razer green” hue. Included with both Razer Ornata models is an attachable wrist rest that snaps in place using magnets. 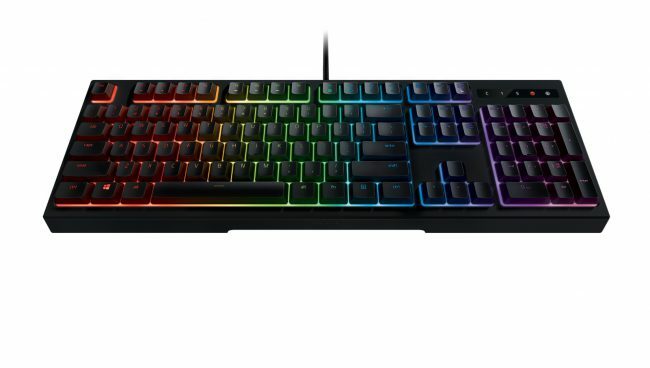 The Razer Ornata Chroma ($99.99) and Razer Ornata ($79.99) are available for pre order now from RazerStore.com. 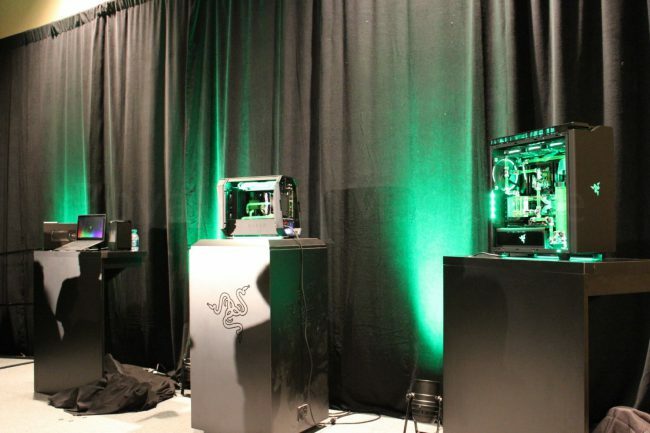 Razer announced their partnership with MAINGEAR, maker of custom gaming desktops, notebooks and workstations. The newest product of this partnership comes in form of the new PC gaming tower, the MAINGEAR R1 | RAZER Edition. 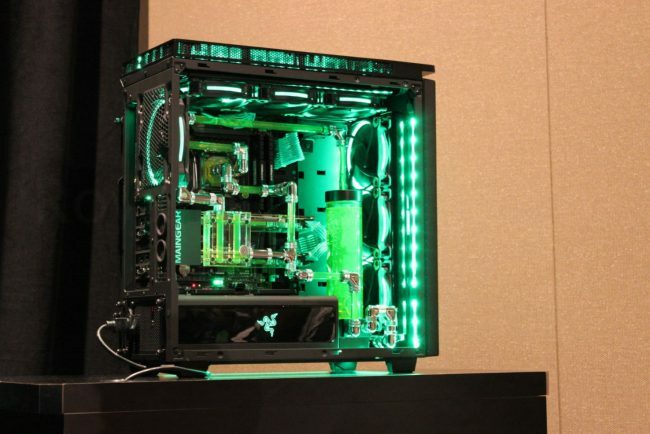 The MAINGEAR R1 | RAZER Edition PC tower will foster a multitude of customization options at the point of purchase, allowing buyers to pick the components that they specifically want in their build. Deeply illuminated in “Razer green”, each MAINGEAR R1 | RAZER Edition order will be assembled by hand in MAINGEAR’s New Jersey facility, utilizing Origami Wiring and options for liquid cooling. The new system is 4K and VR ready, allowing gamers to take their play to a whole new level with incredible graphics options from NVIDIA® and AMD®, along with the latest Intel® Core™ i7 processors. The MAINGEAR R1 | RAZER Edition offers incredibly fast and reliable storage options, supporting the latest NVME SSDs as well as massive 10TB HDDs. Memory options allow for up to 32GB of premium HYPERX DDR4 memory.